Below you will find key publications by SAJE researchers. Click through to view. McHenry, G., Crockrell, V., Holmes-Ware, L., Coil, A., Young, J., Drake, E., Hamilton, Z., McCurley, C., Peterson, A., Walker, S., & Valencia, E. (2018). Washington State Partnership on Juvenile Justice 2017 Annual Report to the Governor and State Legislature. Olympia, Washington. Walker, S., Valencia, E., Bishop, A., Irons, M. & Gertseva, A. (2018). Developing a coordinated youth housing stability program for juvenile courts. Cityscape, 20(3), 117-137. Walker, S., Valencia, E., & Vick, K. (2018). Report of a Research to Practice Partnership to Develop the Youth Housing Stability Model for Juvenile Courts. Seattle, WA: Center for the Study and Advancement of Justice Effectiveness (SAJE). Orme, M., McCurley, C., Bricker, C., Skreen, J., Sanford, R., & Wang, W. (2018). Dependent Children in Washington State: Case Timeliness and Outcomes, 2017 Annual Report. Olympia, WA: Washington State Center for Court Research, Administrative Office of the Courts. Hamilton, Z., Kigerl, A., Mei, X., Routh, D., & Kowalski, M. (2018). PACT validation and weighting results technical report: Deliverable 1: Updated PACT risk and needs assessment. Pullman, WA: Washington State University. Walker, S., Bishop, A., Haumann, E., & Catena, J. (2017). Deploying street outreach workers to reduce failure to appear in juvenile court for youth of color: A randomized study. Crime & Deliquency, online first. Esposito, M., Lee, H., Hicken, M., Porter, L., & Herting, J. (2017). The consequences of contact with the criminal justice system for health in the transition to adulthood. Longitudinal and Life Court Studies, 8(1), 57-74. Routh, D., Hamilton, Z., & Campbell, C. (2017). Informing the understudied R: Exploring and advancing typological research. Justice Quarterly, 1-32. Gilman, A. & Sanford, R. (2017). Washington State Juvenile Detention 2016 Annual Report. Olympia, WA: Washington State Center for Court Research, Administrative Office of the Courts. Hamilton, Z., Tollefsbol, E., Campagna, M., & Van Wormer, J. (2017). Customizing criminal justice assessments. In F. Taxman & Dezember, A., Handbook on Risk and Need Assessment: Theory and Practice (pp. 333-377). London, UK: Routledge. Walker, S. & Bishop, A. (2016). Length of stay, therapeutic change and recidivism for incarcerated juvenile offenders. Journal of Offender Rehabilitation, 55(6), p. 355-376. Hamilton, Z., Kigerl, A., Campagna, M., Barnoski, R., Lee, S., Van Wormer, J., & Block, L. (2016). The development and validation of the STRONG-R recidivism risk assessment. Criminal Justice and Behavior, 43(2), 230-263. Walker, S., Bishop, A., Logan-Greene, P., Nurius, P. (2016). The heterogeneity of treatment needs for justice involved girls: A typology using latent class analysis. Criminal Justice and Behavior, 43(3), 323-342. Lee, T., Walker, S., & Bishop, A. (2016). The impact of psychiatric practice guidelines on medication costs and youth aggression in a juvenile justice residential treatment program. Psychiatric Services, 67(2), p.214-220. Kigerl, A. & Hamilton, Z. (2016). Triaging psychiatric care: Risk assessment construction and validation for Washington's involuntary treatment and forensic commitment populations. International Journal of Offender Therapy and Comparative Criminology, 61(15). Correll*, J., Walker, S., Edwards, T. (2016). Parent perceptions of participating in a program for adolescents who are violent at home. Journal of Family Violence, online first. Walker, S., Bishop, A., Pullmann, M., Bauer, G. (2015). A research framework for understanding the practical impact of family involvement in the juvenile justice system: The juvenile justice family involvement model. American Journal of Community Psychology, online first. Walker, S., Bumbarger, B., & Phillippi, S. (2015). 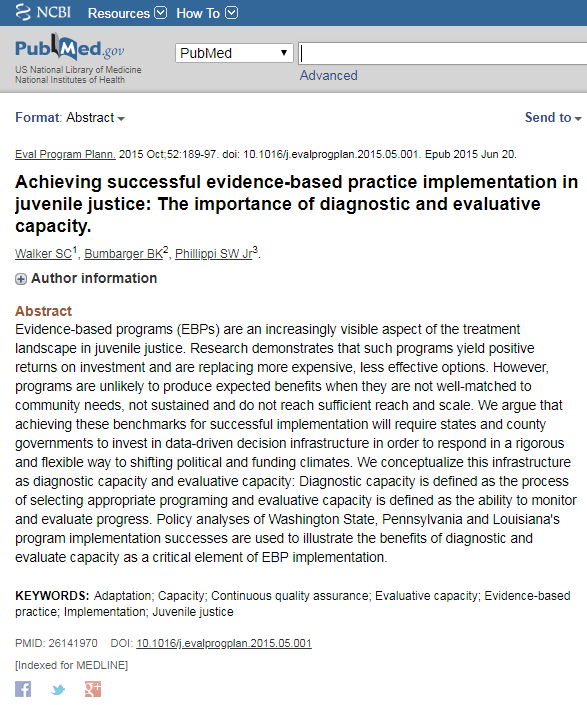 Achieving successful evidence-based practice implementation in juvenile justice: The importance of diagnostic and evaluative capacity. Evaluation and Program Planning, 52, 189-197. Peterson, A. (n.d.). Juvenile recidivism in Washington State: A 2013 court cohort and 2014 juvenile rehabilitation release cohort. Olympia, WA: Washington State Center for Court Research, Administrative Office of the Courts.